The stock market’s rebound has been strong and consistent since making a low on Christmas Eve. It has been marked by a high percentage of stocks of all sizes and most industry groups moving higher in unison. This pattern has been a hallmark of past bull markets. The underlying economy is still growing, albeit at a slower rate. A growing economy should generate higher corporate profits and therefore higher stock prices. The opposite is true for a weak economy. Perhaps the most discussed economic indicator of late has been the remarkably low rate of unemployment, which has been below 4% for several months. The Federal Reserve has long pointed to low unemployment as a risk for higher inflation and therefore a need to increase interest rates to slow the rate of employment growth. 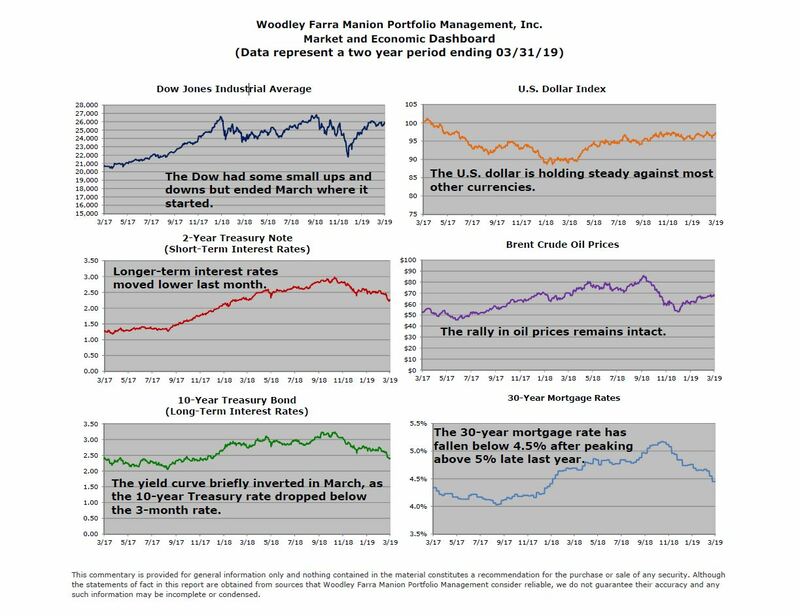 This attitude led the Fed to increase interest rates four times in 2018, which triggered the subsequent fourth quarter near-bear market in stocks. The labor participation rate is the number of people available for work as a percentage of the total population, i.e. people that have a job or are willing to work. The higher the participation, the more availability of workers and therefore less pressure on wage growth to compete for workers. 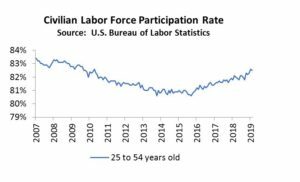 Analysts have been predicting a steady decline in the labor participation rate as the population ages and fewer younger individuals seem interested in working. The chart to the left debunks the prediction of fewer people willing to work. In fact, the growth in the 25-54 year-old workers over the last four years has been a nice surprise. 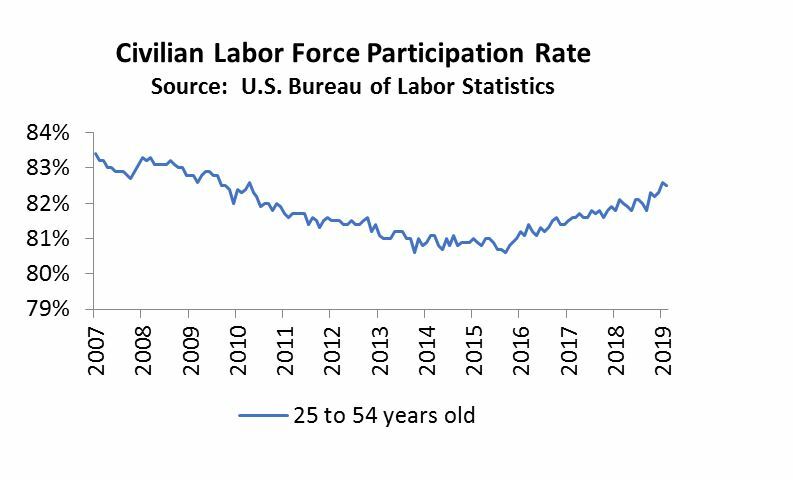 The longer-term trend of a lower participation rate will likely resume as more Baby Boomers finally retire. But more workers are helping economic growth and keeping inflation in check. And if inflation stays under 2%, the Fed can be patient and will not need to tighten monetary policy any further. Increasing immigration is one option to offset an ageing workforce. Improving worker productivity is the other factor needed to keep growth moving higher. Both are difficult to achieve in their own way. The current economy is doing well under present conditions. *Woodley Farra has filed its updated Form ADV registration statement with the Securities and Exchange Commission. Please contact our office at 317-269-0224 to request a copy. This article was posted in Dashboard and tagged dashboard, economic dashboard, economic indicator, economy, finance, inflation, inflation rate, labor force, labor participation rate, SEC, Securities and Exchange Commission, stock market, unemployment rate, US economy. Bookmark the permalink. Follow comments with the RSS feed for this post.Post a Comment or leave a trackback: Trackback URL.